I think these will be perfect for one of my very good friends whose birthday is coming up next month. She has a very clean style, and her house is always so immaculate. I know, I should hate her LOL! Thank you so much for stopping by! 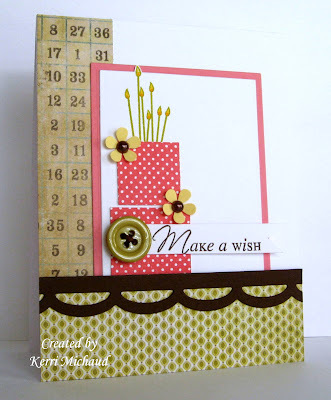 I'll be back tomorrow with a new Your Next Stamp Challenge! This is so beautiful Kerri! I'm sure your friend will love it! Fabulous!! Love the clean lines of these! Love your paper-pieced cake! I'm glad I'm not the only one who has uninked stamps - lol! Amazing, Kerri! Makes me want to rush out and buy this stamp set RIGHT NOW! Beautiful work! Awesome. Your cakes look so fun and so creative. Awesome work on both of them.